WIlliam Hervi's gravestone is located in St Kentigern's Cemetery. William Hervi, or Harvey, was a weaver in Lanark. He was taken before the Justiciary Court in Edinburgh on 20 February 1682. Three charges were laid against him viz; that he was present "at the late rebellion", i.e. the Battle of Bothwell Bridge, and also at the publication of the treasonable Declaration" at Lanark on 29 May 1679 and that he had taken part in the publication, on 12 January 1682, of the Declaration circulated by the Societies. The Judiciary Court failed to pronounce sentence on him until ordered to do so by the Council. He was found guilty and sentenced to death. A party of guards was ordered to take him to Lanark where-they were to witness his execution. Before his death he was granted permission to emit a brief testimony. The authors of "The Cloud of Witnesses" make no reference to him, probably because he acknowledged the authority of the King. Most of the information which exists is derived from "The History of Sufferings of the Church of Scotland" by the Rev. Robert Wodrow. Hervi affirmed that he was a Presbyterian and that in his judgment people should obey the King in his lawful authority. He had been condemned to death for "Proclaiming a paper over the cross", It had contained in it statements against Prelacy, "but he had acted out of conscience and urged people to repeat the petition "God Save the King". He believed what was contained in the scriptures and adhered to the Confession of Faith, National Covenant, and Solemn League and Covenant, the Catechisms and all the faithful testimonies since 1660. He declared himself to be for "Kingly government according to God's word." He prayed fervently at the Cross then he climbed the ladder and exhorted those present to make their peace with God, and to serve God, and the King so far as this was compatible with the Word of God and no further. He prayed again, committed himself to God's mercy and freely forgave all those who had a part in his death. It is recorded that he died with a great deal of composure. Wodrow appears to be uncertain as to the immediate cause of his death but it is clear that the authorities were determined to proceed against those concerned with the Societies' Declaration of January 1682. 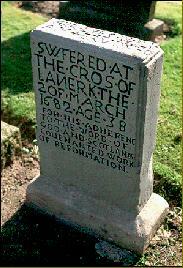 The inscription on Hervi's gravestone records that he suffered "for his adherence to the Word of God, and Scotland's Covenanted Work of Reformation".